I have a confession to make. I wasn’t planning on writing about anything other than LMS stuff on this blog, but I have something I need to get of my chest. It’s true. I have had other projects besides hacking away on the EV3. I’m not proud of it, but that is how it is. And that is why I haven’t made any updates on this blog in a while. My other project sort of have a deadline and with christmas coming up finding time for one project is difficult, and finding time for two projects is near impossible for me. So I will keep working on my other project for a bit, and when that is done I can come back to wrestle with the LMS VM on the EV3. This entry was posted in Uncategorized on December 14, 2014 by Magnus. 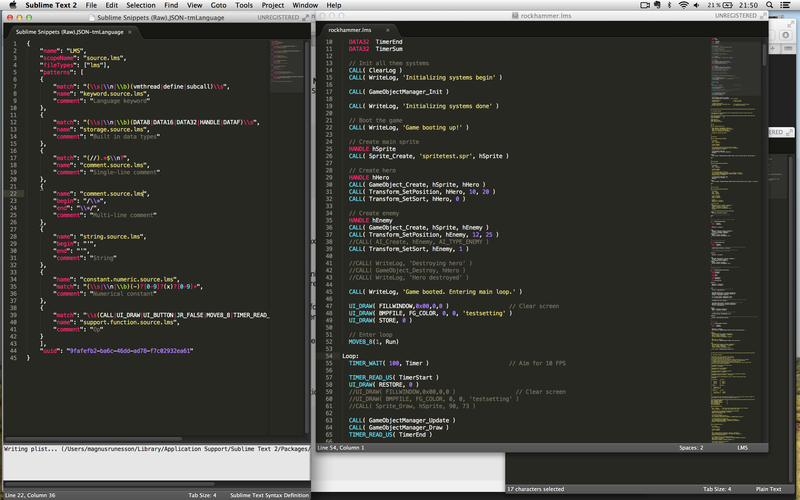 I’ve been working a bit on getting LMS syntax highlighting in to Sublime Text 2. I’m struggling to get labels to highlight properly but I’ve got a lot of the basics in there. It’s easy but boring to add all op codes so I’ll add them as I go along. It will be fantastic! This entry was posted in Uncategorized on October 29, 2014 by Magnus. For a while I’ve been wondering about the performance of the EV3 and I’ve been thinking that since it is a 300 MHz ARM9 processor I figured the performance shouldn’t be an issue. But after building a simple framework that draws one image using UI_DRAW BITMAP, and drawing 2 sprites that does UI_DRAW PIXEL for each pixel in the sprite I am already using up 90 of the 100 ms I have for each frame. This basically means that to achieve 10 fps I can’t do more than draw one background and two sprites. So that is a bit disappointing! There is a trick to copy the current frame buffer to a temporary buffer and then copy that buffer back to the frame buffer, and it is a cheap operation to do, so when I removed the UI_DRAW BITMAP that draws the background and only do that once, copy the drawn image to a buffer and then for each frame copy that buffer back to the frame buffer I get down to 59 ms per frame. So that’s a bit nicer. Removing my own sprite drawing function but keeping the buffer copying thing the frame time is reduced from 59 ms to 0.3 ms, soooo .. that’s embarrassing. If I keep all my code but remove the call to UI_DRAW PIXEL the frame time is 44 ms, so the actual drawing is somewhat expensive, but since we use quite a lot of frame time even without drawing then perhaps there is a chance to optimize this. If I remove the reading of the pixel in the sprite I get down to a frame time of 21 ms. In these 21 ms it is all “my” stuff, meaning it is my inner loop in the sprite drawing, my algorithm to sort the game objects (bubble sort ftw), my overhead for managing game objects etc..
And if I remove the call to Sprite_Draw entirely I’m down to 1.5 ms. So the time is spent in that function. // Read sprite dimensions. Keeping READ_CONTENT since this code works. will reduce the frame time to 52 ms, so a slight improvement, but still not good enough. So I’ve gotten the frame time down from 90 ms to 52 ms and I’ll accept that performance for now, leave the optimization aside for a while and get on with the actualproject. This entry was posted in Uncategorized on October 18, 2014 by Magnus. Today I’ve expanded a bit on the component way of thinking. I used to be able to create a game object and add transform and sprite components to them, and today I also added an AI component. I also figured I want each component to have an update function that is called each frame. So close but no cigar! It is with a heavy heart I must inform you that I just can’t get those stupid addresses and handles to work! I have tried allocating memory using ARRAY CREATE and reading and writing to it using READ_CONTENT and WRITE_CONTENT. It sort of worked but turned out that WRITE_CONTENT reallocates the buffer and it only allocates up to the entry I am currently writing to. So if I have an array of 4 entries and I write to entry 3, the content of entry 4 will become garbage. I have tried reading the address of an array allocated with ARRAY CREATE but I haven’t been successful. I did manage to read the content of the array by doing @myHandle, but reading was never the issue. Writing was. I also tried to get the physical address of some memory by using the & operator, but what that does is take in the parameter, read the content of the parameter and use as address from which other content is read and used as pointer. But that didn’t work either. My best guess is that it reads the content of MyMemory, which is zero initialized, and then use 0 as address to read another address from. So after all that, what is next? I have NO clue how to work with memory in LMS2012. I can’t for my life figure out if it is possible to .. ARGH! It has happened AGAIN. When writing up my blog post I often find myself going back to earlier things to investigate further. Something I did again today. I looked through all existing code and found that only a small test LMS script actually used ARRAY READ_CONTENT and WRITE_CONTENT, and I wasn’t surprised as they don’t work very well. What I did find though was these OP codes. ARRAY_WRITE and ARRAY_READ. So I will read up on those and then come back, either with yet another blog post about how handles and arrays don’t work, or another “this is the last rant on arrays” blog post. Either way I will return shortly! Quick update since I’m on the move and don’t have access to the source code. My final experiment last night was sort of successful. I allocated an array using ARRAY CREATE and on the handle that was returned I used the @ operator, so I did MOVE32_32( @handle, variable ) and the content of the variable was something like 0x00032ac30. Then I did MOVE32_32( &variable, var2 ) and var2 was set to 0x0201. So that seems great but the reason why I’m not yet happy is because I then tried to set the contents of the array with ARRAY WRITE_CONTENT and after that my experiment fell apart and I could no longer use the & operator, not even when I reverted back to the exact same code I had used when it worked the first time. So in conclusion, this seems like it might work but I’m also having trouble taming it. This entry was posted in Uncategorized on September 30, 2014 by Magnus. Yesterday I played around with using & to get the address of a variable. In assembler.logo there is a function called get-adr that is called when you do & on a variable. So I looked at all the existing LMS files that shipped with the LMS2012 and none of them used the & operator. I’ve done some simple tests to just look at the compiled RBF file when doing & and see if I get any wiser. After that I’ll look into @ and see if that is anything I could use.